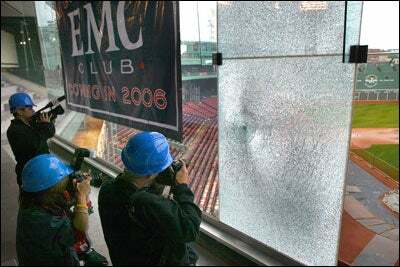 The Red Sox today shattered the glass on the façade of Fenway Park’s .406 Club, marking the beginning of the demolition of the enclosed seating area to make way for the open-air EMC Club. The existing .406 Club (606 seats) and Red Sox Hall of Fame Club will be converted into two seating tiers in time for Opening Day in April. The new section will include 406 open-air seats and an enclosed lounge behind the seats with a view of the field. According to the Red Sox, the new section will have high wider, heated seats, waiter and waitress services, private dining rooms, a business conference center, and a dedicated concierge to facilitate purchases of tickets to Fenway and other entertainment venues. Here’s a photo of the glass-breaking ceremony, taken by Globe photographer John Tlumacki.